How many of these qbs players played under the same circumstances Hackenberg did? no1es run this and Roddy Right dapped this. GMoneyMafia, RubioTheCruel and Tide Run This dapped this. I dont think there are any quality starting QB's in the NFL that didnt meet or exceed those metrics. Also the 3 year starter/30 games is a big benchmark as well. 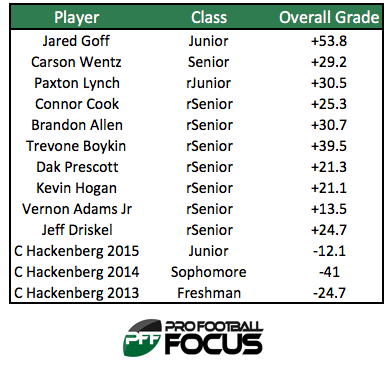 Hackenberg and Cooks completion % probably wont improve that much if they couldnt complete 60+ in college. Cardale Jones threw less than 300 total passes in college which would generally make him undraftable if he didnt play at OSU. And they've still had top 15-25 classes since then. Gonna act like none of those players played with him the past three years? He's white and "looks the part"
Listen, gtj1982, Freddie.Cane and 3 others dapped this. Listen and malbaker86 dapped this.